Our stay wasn't terrible, but it was the low point in our 5 stops in FL. The location is pretty good for many interesting destinations, though. Short term travel camping is stressful as the majority of the sites are long term campers and in-place modular and mobile homes. Backing in a travel trailer is VERY tight. I don't think I could have backed in had it not been for the site behind me being vacant and allowing me to pull through into my site (but not without running into our electrical pedestal - fortunately no damage). No WiFi - except for the club house - and no cable TV. There is only a single bath house with only two showers (and one was being redone). It took a good 3-4 minutes for hot water to flow in the showers and the sink. But, things were clean, the club house and pool were nice. It's just not a good campground for shorter term stays. We stayed for a week in early March having made our reservation approximately 4 weeks in advance. Had some language difficulties with check-in, no guidance as to parking. Using the position of the electric, water, etc for guidance (and a sign across the street "not parking or driving on the grass") we spent most of an hour getting into the space as it had a tree in what appeared was the drive. Later we were told to park on the grass not in the space! The site as very uneven and the grass they wanted us to park on looked like a ditch. The laundry was dirty although the machines did work. Used the showers once, almost no water flow and it never got hot, the bathhouse was also very dirty. Streets were paved but narrow. Park is mostly old single or double wide trailers, some RV spaces mixed in. The residents that spoke English were pleasant. We will not stay here again and would not recommend it. Like previous reviews just keep driving!The whole month we were here no one would talk to us very unfriendly place.Pool was unusable because of sanitary concerns.Noise from Motorcycles riding round and round at 8 in the morning power tools. power washers 8 till 6 loud speakers for events parties at individuals rv sites and on and on the whole month could not even read a newspaper.Worked in a factory and it was quieter.Management will probably write rebuttal to this review but it`s just phony once they have your money good luck!They could not care less. This is a big draw for the French Canadians all winter long - draw your own conclusions. In the summer it is much quieter and easier to enjoy - if you can take the heat. Not a bad place to stay, nice pool and bathrooms/showers are OK. Community has a gate and security is good, maintenance is good as well. Sites are very small and tight but pleasant. Recommended for a week or two stay, close to the Keys. Dear Guest, thank you for taking the time to share your feedback regarding your stay with us. Our community is very unique and we welcome guests from all over the world, for a variety of reasons. We are pleased to read that you enjoyed our heated swimming pool, it is one of our most popular amenities! Our mission is to ensure that our guests have a memorable and enjoyable stay with us. Our on-site management team and overnight courtesy officers strive to provide excellent service and we will be sure to share your comments with them. Thank you again for your time. Safe travels to your next destination! Keep on driving. 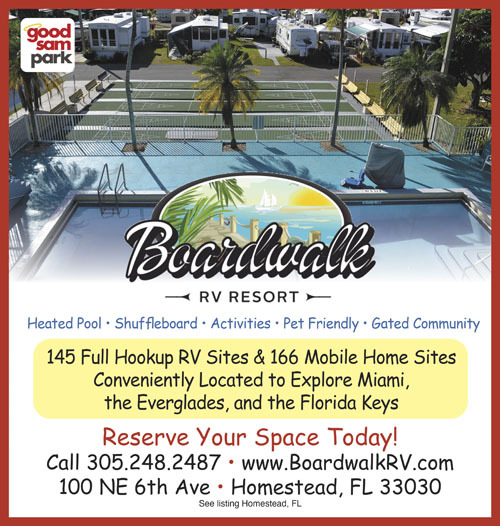 This is not a RV resort, it is a mobile home park with a couple of spaces for RVs. The roads a narrow to get to the sites. I have a 37 ft class A and could hardly navigate the turns. Also very expensive for a grass pad that wasn't level. Dear Guest, we are concerned to hear that you had a less than desirable stay with us. We do our best to assign guests to the most accommodating site for their rig and we apologize as it sounds like you weren't pleased with your site. When possible we do accommodate site changes - as we ultimately do not want guests to be unhappy during their stay. While it won't be easy to change the layout overnight, we are an ever-changing, growing business and our mission is to make our accommodations as current as possible to meet the needs of our RVer's. 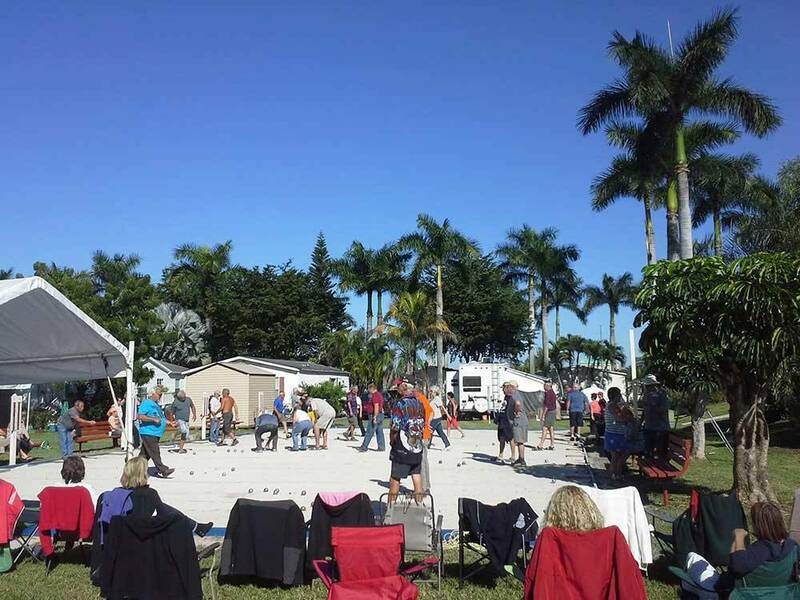 Our community is unique and we have 145 RV sites and 165 manufactured homes. We do take note of the areas that need improvement and we assure you that they are being addressed. We would like to learn more about your stay so that we can do our best in enhancing our current sites. Feel free to contact us via email [email protected] or by calling 305-248-2487 and ask to speak to our property manager. Thank you for your time and we hope to earn a second chance in the future. You need to just keep driving. Upon entering the facility it's not too bad. Mostly Park Models and a decent looking club house, fitness room and pool area. The office is a little hard to find but it's a small park model to the left of the clubhouse as you are coming in off 6th street. The transient RV spot we were given was in an area near a major road that was noisy all night. Couple that with the obnoxiously loud, thumping Latin music of some of the residents driving through and it makes for a long night. The mowing behind us started at 6:00am, promptly. The sight was extremely difficult to get a 36' Class A in and then it was a grass sight which was soggy and muddy since it had been raining for 24 hours prior to our arrival. You need extremely good 'Jack Pads' if you plan on leveling your rig for the night. The utilities in this area are a joke with a power box that had the face plate loose exposing the wiring inside. You will need to go to the main power panel behind one of the full time campers to turn the power on and off before plugging in. There is no breaker at your assigned site. To add to the frustration the power receptacle at the site was wired in upside down so my surge protector had to be plugged in upside down. The site itself was narrow and had shrubs and trees overgrown making it an obstacle course to even get the coach in. The neighbors, mostly full time residents parked in the grass along the road and the site across the street right in front of the site we were assigned had a boat for sale sitting parallel to the street and a SUV barely parked off the street in the grass behind the boat. The resident next to our site had 4 or 5 young (10 year old) kids running all over the place, including our site, being crazy as kids can be. Over all this place is the epitome of Trailer Trash Ville. The rate of $42/night is about $4o too high. If you are headed South keep going down into Key Largo and if you are heading North get to Naples. Avoid this place like it has the plague because it probably does. Or you could stay here if you really don't need any rest or have a real need for a high level of anxiety. Dear Guest, we appreciate you taking the time to share your feedback with us in regards to your most recent stay. Our team takes great pride in maintaining a exceptionally clean community, with desirable amenities that RV guests need and want. We apologize to hear that you encountered issues during your stay, as our on-site management team strives to ensuring that our guests have an enjoyable stay. We do take care of issues promptly when they are brought to our attention. I would like to learn more about your experience, so that we can make the proper corrections. Please contact us at [email protected] or call 305-248-2487 and ask to speak to the property manager. Thank you.